We've heard the cases for the Opel Adam in the U.S. One solution might be to make the Adam more rock-worthy for arduous American roads. The Adam ROCKS that's being shown next month at the Geneva Motor Show would do, but it's still not coming here. It's understandable Audi would want to butch up an A4 Avant and call it the Allroad, especially since it's all-wheel drive and it's like a half-step from a Q5 at that point. 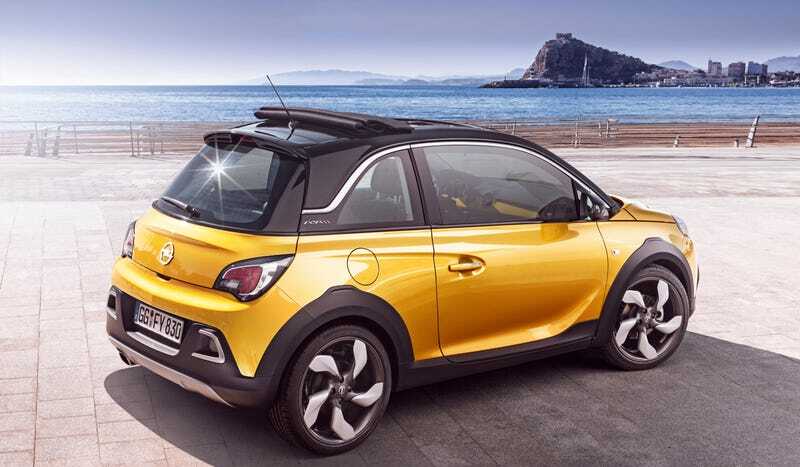 Roughing up a minicar as Opel has done by making Adam ROCKS is more along the lines of putting a Smart in hiking boots. No idea what they were going for here. As useless as it is, the taller ROCKS that rides on 17 or 18-inch wheels is still really funky to look at. It screams "active person's car," but I bet that bumper cladding will work almost as well as those Bumper Bully protectors everyone in dense cities strap to their Mercedes CLAs. Oh, and the ROCKS is also offered with GM's new three-cylinder engine. It's a nice reminder that it's not just the French automakers keeping silly little cars from Americans.